Wood shingles or shakes add beauty and style to many types of homes including Queen Annes and Tudors. While wood shingles or shakes are widely used in North America, they tend to be more expensive and require proper installation and care for a full life expectancy. So what is the difference between a wood shingle and shake? The terms are often used interchangeably (we'll do so here). Wood shingles are sawn and typically smooth and uniform in appearance. Shakes are generally split, but can be sawn on one or both sides. Not all wood shingles are created equal. There are standard industry grades from Number 1 to 3 and Undercoursing Grade. Number 1 is the highest grade, and is generally edge grained (grains appear in long parallel lines) with limited knots, defects and flat grains (grains appear in V-shaped curves). Undercoursing, the lowest grade, is generally used for an underlying layer for sidewalls. Aside from appearance, defects and grain can affect the durability and aging performance of a shingle. Edge grains tend to resist buckling and warping better than others. The most popular type of wood shingle or shake is made of Western Red Cedar. Cedar has natural tannins and oils which can slow decay and resist pests. However, many homeowners and contractors contend that Southern Yellow Pine--when treated--can be a good second choice. There are two major factors to consider if you chose wood: The installation expertise of your contractor and the durability of the wood materials that you pick for the job. 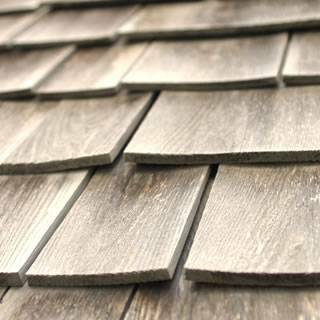 Even the best quality wood shingles are eventual prey to long-term damage by wind, rain, exposure to relentless sun, and flying debris. One of the biggest enemies for wood shingles is moisture. Modern roofing techniques involve the use of solid plywood sheathing. Ironically, this undermines the ability for your roof to breathe. Are Wood Shingles Right for Your Climate? You can get a contractor on board for the installation of wood shingles virtually all around the country. But whether shingles are a good choice for you depends a lot on where you live. Surface treatments and decay-resisting protectants may extend the protection and durability of your shingles. But climate and fluctuating weather conditions may have a large say in how well they wear--and the amount of routine maintenance you'll need to perform. For use on the roof, a semitransparent, penetrating oil-based stain with high concentrations of pigment can be the most durable in all conditions. Wood preservatives and water repellent treatments are also a good idea, and you should ask your installation contractor if your shingle products have been dipped in treatments before shipping. After installation, copper naphthenate or copper octoate treatments can help battle lichens, rot, moss, and other damp climate adversaries. In the humid climates of the American Midwest and South, you can have the contractor apply fungicide treatments to battle mildew. Ask a roofing contractor prior to installation about the use of galvanized copper or zinc ridge caps that naturally prevent mold from getting a toehold on your wood shingles. You can find elegant gutters to create a great look with your wood. It's up to you to continuously clear fallen leaves and limbs from wood shingles to prevent rot, and you should trim overhanging branches that keep portions of the shingles in perpetual darkness and moist conditions. If this sounds like a lot to ask, wood shingles may not be your best first choice.